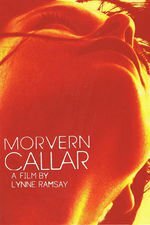 Following her boyfriend's suicide, supermarket clerk Morvern Callar passes off his unpublished novel as her own. With the money her boyfriend left for his funeral, she leaves Scotland for Ibiza where she travels with her closest friend. I love the novel - I've read it dozens of times. I've only watched the film once though. It's not a bad film, but yes - it drifts, it's aimless. Yet it's not an unpleasant way to pass a few hours, body disposal scenes aside. I don't know. It seems like when I think about it, this is the only possible film that could have been made from the novel, yet I expected more somehow. Samantha Morton was amazing, though. When I polled my twitter feed for whether this film qualifies as 'strange' in a way that fits for this club, it was evenly split between yes and no. I think both perspectives are valid. It's 'strangeness' is never overstated, and comes not from explicitly surreal or absurd moments, but rather from the enigma of the protagonist's inner state, and her motivations for doing what she does throughout the movie. In that sense it's maybe a bit like Uncle Boonmee. Both are films that operate according to their own internal logic, a logic that makes sense for these particular characters and this particular setting, and we're given a window into that world. What we take away from it is up to us. On a different note, I sometimes fret about things like gender representation and perspective when it comes to this particular kind of cinema we're exploring, and I'm glad we could watch a movie that was written and directed by women, with such a complex, fascinating female protagonist. I wish more people would write women characters with this much nuance and depth. I absolutely adore this film. This and Ratcatcher make Lynne Ramsay one of my favorite directors. The thing that -- to me -- keeps the film from seeming aimless is the opening. Without the inciting incident of the boyfriend's suicide, the film could easily seem drifty and meandering, but the suicide, the novel, the body disposal, all color the rest of Morvern's actions and make them all fascinating. We're watching her process her grief, shake off the dark Xmas-lit cavern where she lived for so long and move on into sun-drenched Spanish vistas, while retaining the mixtape that he left her -- she's not forgotten him, after all. Everything she does in the film is a working-through of those initial scenes. I thought her motivation was quite clear--a wish to deny reality. It's a fairly common wish though usually less extreme. If you call it "denial of death" it becomes even more common. I haven't had a chance to rewatch this, but I wanted to chime in with my appreciation of Lynne Ramsay, who is a master director. She has not made many films, but I have found all of them to be stunning and deeply memorable, especially Ratcatcher, which is a heartbreaking exploration of childhood guilt. One aspect of the film that should be mentioned is that it is made clear, although not explicitly as far as I remember, that Morvern and her boyfriend are of different classes. I think understanding the class gap between them is part of understanding her actions, but I was never fully able to work out my thoughts on that aspect. I think understanding the class gap between them is part of understanding her actions, but I was never fully able to work out my thoughts on that aspect. I agree with this, and I'm still working out my thoughts there too. Ebert touched upon this in his review. I think part of it is that you sense, though it's never outright stated, that there was a power disparity in their relationship. Not just power in terms of relationship dynamics or money, but also in terms of cultural knowledge, assuredness, wordliness, etc. You get the sense that she listens to that (amazing) mixtape half wanting to access that world of her boyfriend's that she didn't quite have the savviness to grasp. Not only that, but there's something distinctly offputting about this aspect of her boyfriend. He's condescending even in his suicide note. "Don't try to understand," he tells her from beyond the grave. He doesn't even give her the courtesy of an explanation. There's a gender component to all of this I can't shake, too. The condescension of the suicide, the manuscript, the seeming desire to be immortalized for his artistic genius after his death, whatever it is that raises my hackles - it's somehow very gendered. In light of this, her actions make a sort of sense. You can read her decision to pass the manuscript off as her own as radical, in terms of the relationship and the suicide. An empowering act to not give him the satisfaction of getting what he wanted out of his death. I don't know. I have complicated feelings about this movie! I still have to watch this one, but I thought it might be a good time to point out that The Duke of Burgundy is now available for streaming on Netflix. This one was a slow burner for me. I took a bit of time to get my thoughts together about it, and it took a few days more before I had time at a keyboard to get them on here. I think the comparison to Boonmee is apt, but the deliberate pace that felt so elegaic and pastoral in that film turns into something more depressive and devastating in this one. I've never lost a lover or even a good friend like Morvern does, but I know what it's like to have the rug pulled out from under your whole life, and then spending what seems like ages in an paralyzed state with no next move that readily suggests itself, a feeling that the movie captures wonderfully in the opening scenes. Whatever her issues might have been with her boyfriend (and I think naju's right on the money with the class/power differential theory) I don't get the sense that theirs was an unhappy relationship, at least not consciously so. She undoubtedly ceded a good deal of her personal autonomy to him in exchange for emotional security, and maybe for him a relationship with a grocery clerk was his way of dodging higher expectations. It was comfortable, or maybe at least not-uncomfortable, and it wasn't until he was actually gone that she realized that he'd trapped her with him. It must also be noted that the pizza that appears onscreen just before Morvern discovers the manuscript is like a literal food-avatar of sadness. I have a feeling that the filmmakers probably went through a lot of depressed-looking supermarket convenience foods before finding the perfect embodiment of Morvern's mental state. I always remember this movie as being supremely gorgeous to look at so the harsh fluorescent grocery store scenes are a smack in the face each time.